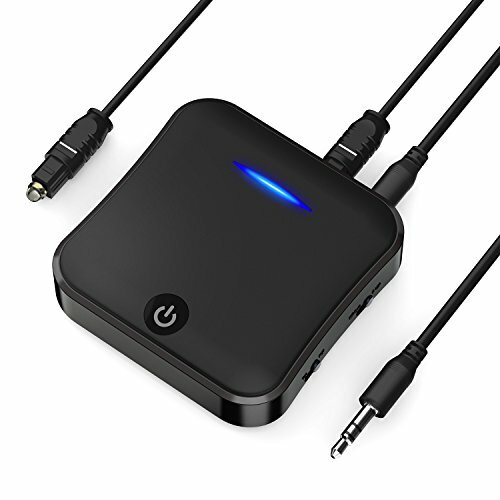 The CHGeek 2-in-1 Bluetooth Adapter with Transmitter and Receiver function is the only wireless audio solution you need. You can transfer movies, TV, games, or music to your Bluetooth headset and also receive audio from your mobile device or tablet through traditional wired speakers or car radios. With the CHGeek Wireless Audio Adapter, almost any device can be transformed into a wireless sound experience. Stop the hassle of uncomfortable cables and cable clutter with our wireless Bluetooth transceiver. 1.Charging is necessary for first use. It can be fully charged for about 3 hours. The LED lights up red during charging and turns off when it is fully charged. 2.The optical terminal and AUX terminal can not be used at the same time. Please note that digital output can not be done simultaneously when digital input. 3.In order to use aptX HD and aptX LL, your Bluetooth headphones and speakers need to have aptX HD and aptX LL function. Otherwise, codec will automatically be aptX or SBC. CHGeek offer its product a full one-year limited warranty and a money back guarantee. If you have any query, you can contact us via amazon seller message. World's First aptX HD in Both TX & RX Mode: Powered by premium CSR8675 chipset, CHGeek Bluetooth adapter supports the latest Bluetooth V5.0, transmits data twice as fast as Bluetooth 4.2 and provides an incredibly Stable Connection at distances over 33 ft. (10 M). With aptX HD, it streams CD-quality sound wirelessly over Bluetooth connections. Long Battery Life: Internal battery provides Bluetooth adapter for more than 24 HOURS of use after 3 hours charging time. It also supports charging and streaming simultaneously. OPTICAL+RCA+3.5MM: Apart from 3.5mm Aux / RCA connection, CHGeek Bluetooth Adapter also supports optical cable (TOSLINK) input / output. With provided optical cable, you can enjoy high-quality digital sound through multiple audio outputs, such as wired stereo, speakers, or headphones. Under TX mode, two Bluetooth headphones can be paired at once so parents can watch in silence and give children a needed break; Under RX mode, two smart devices can be paired for playing different songs. Record 8 devices and automatically re-pairing with existing paired devices.